Good morning! Thanks for joining me today. 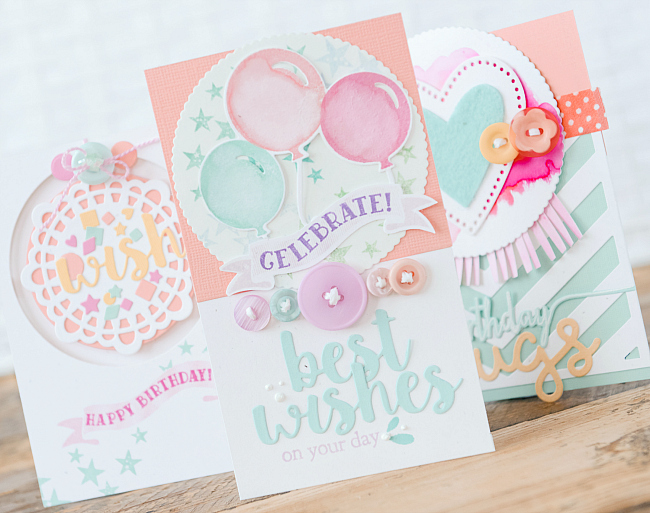 I wanted to share a few more birthday cards, which I created solely with dies and stamps - no pattern paper in sight. 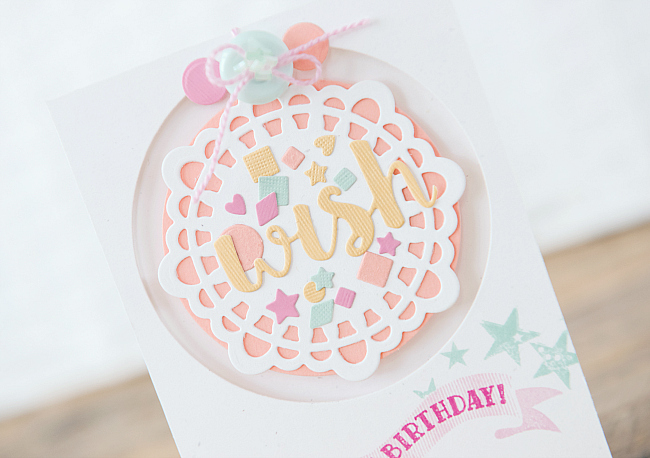 I love, love this color combo - peach, aqua, raspberry and lilac. So I used it quite a bit with these cards. I decided to add a bit of yellow, and I think it transforms the look completely! 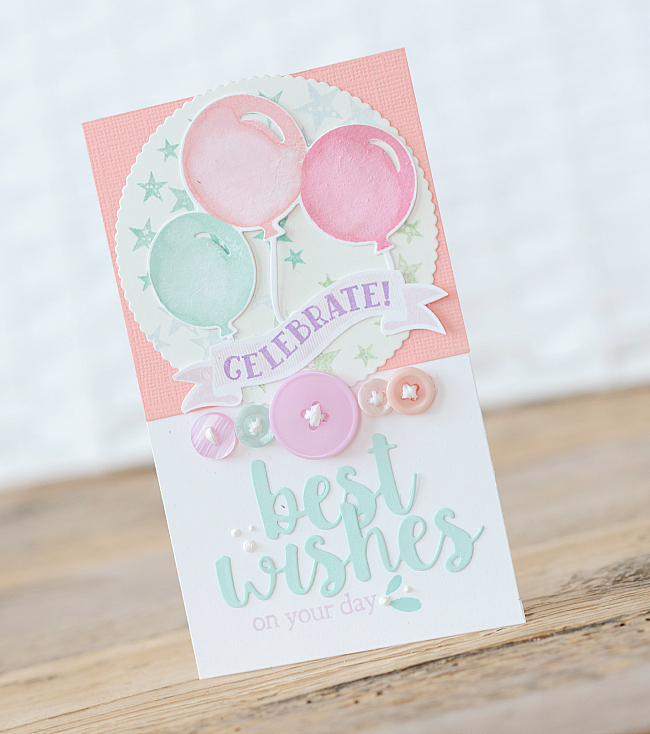 For the first card, I used Papertrey Ink's Scene It: Celebration die and stamp set for the balloons and the starry background. The scalloped circle is from PTI's Scene It: Basic Backer die. I stamped the stars in ombre shades of Mint Julep, Hawaiian Shores, Spring Rain, and Aqua Mist. 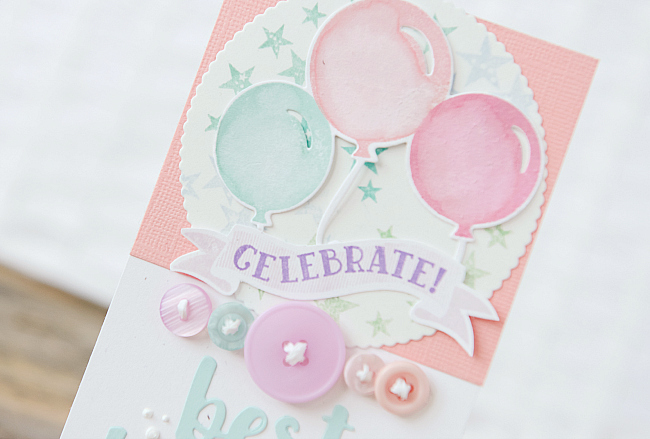 The balloons are stamped in Aqua Mist, Pale Peony, and Berry Sorbet. The balloons got just a touch of water over the ink, while I left the background stamped as is. Just below that, I used the banner die from the set, as well as the sentiment and stamped it in Lilac Grace and Amethyst Allure. The buttons are also from PTI - Lavender Moon, Aqua Mist and Melon Berry. 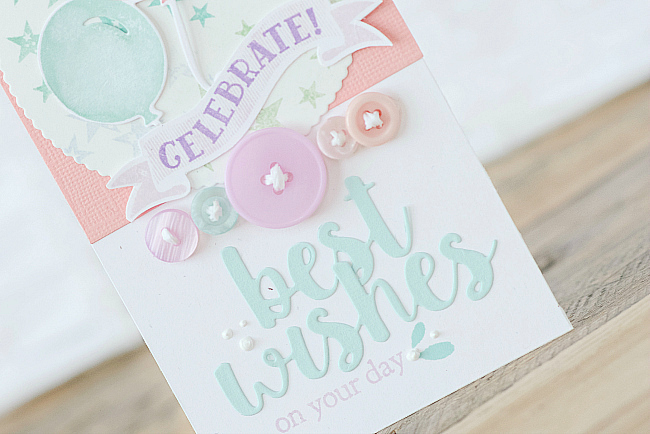 The Best Wishes sentiment is from one of my favorite word die sets - My Favorite Things - Cause for Celebration Die-Namics. Love, love this die! The sentiments are perfect for just about anything, and I love the size. Next up, another Birthday card, but with a little more flair! I was inspired by some v cute pinatas I found online - I've always wanted to have a pinata party. I mean what is more fun than candy raining down on you? So I was initially going to create a shaker card, filled with candy, but this little number has to be mailed, so instead I settled for tassels. 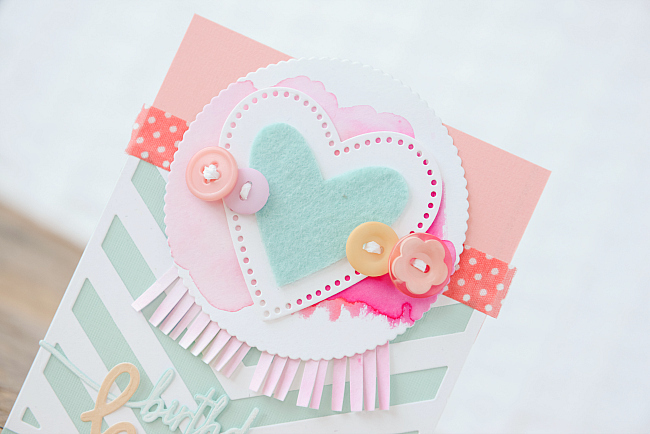 The scalloped circle is from the same PTI Scene It die, and the hearts are both from Papertrey Ink: Limitless Layers: Heart Stitches. I used Aqua Mist felt for the small heart, and a splash of beautiful color with Zig Clean Color Markers - Dark Pink for the watercolored background. The tassels are also colored using the Zig marker, but with a soft wash.
For the background, I used PTI's Cover Plate: Center Stage - one of my favorite designs, as it works with all types of cards. 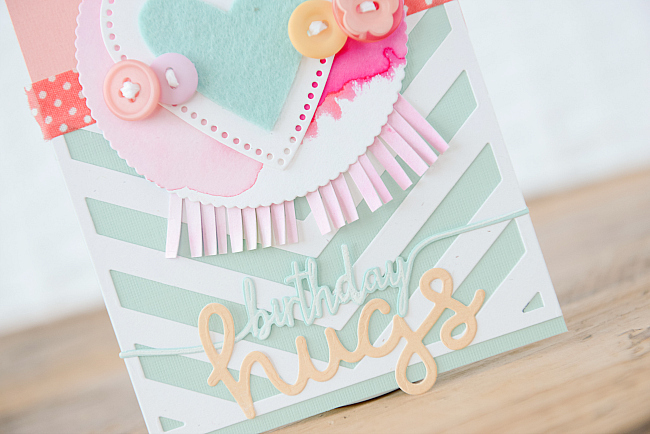 And a sentiment from PTI's Swoosh stamp set and die, as well as this cute Hugs die from Lawn Fawn. 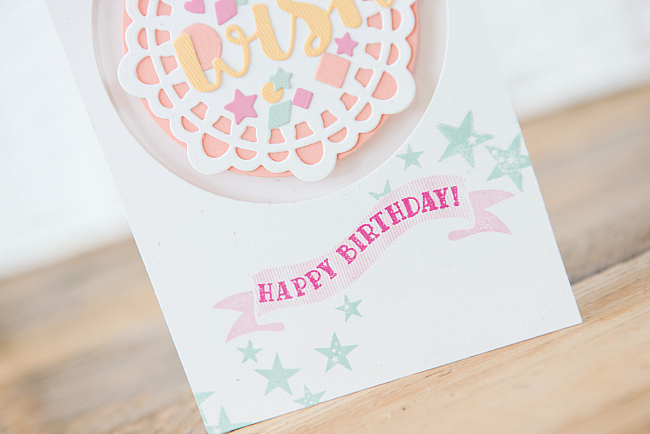 One last birthday card to share - using a few more Papertrey Ink goodies. 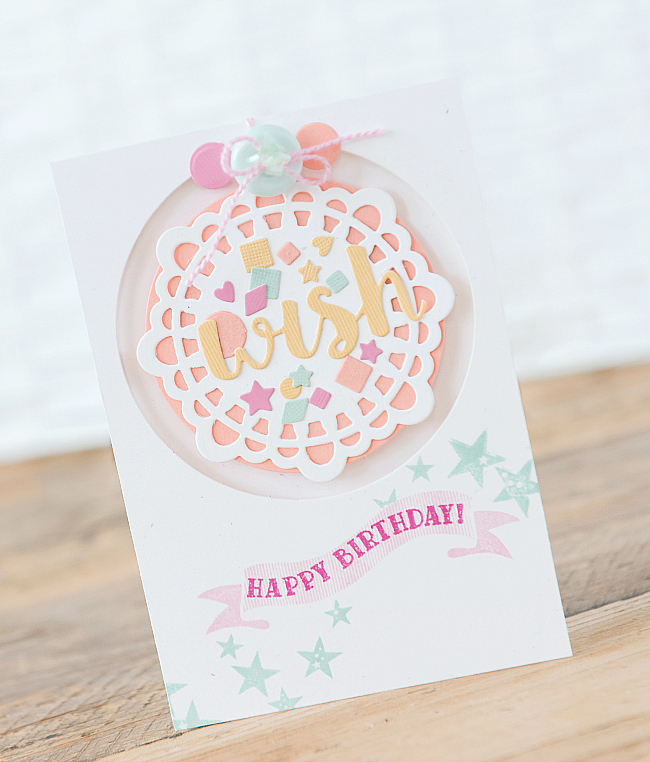 I used PTI's Doily Details A die for the background, and a bunch of sweet confetti from Taylored Expressions Little Bits Confetti die. Just below, I stamped a sentiment and some sparkly starts from Papertrey's Scene It: Celebrations set. 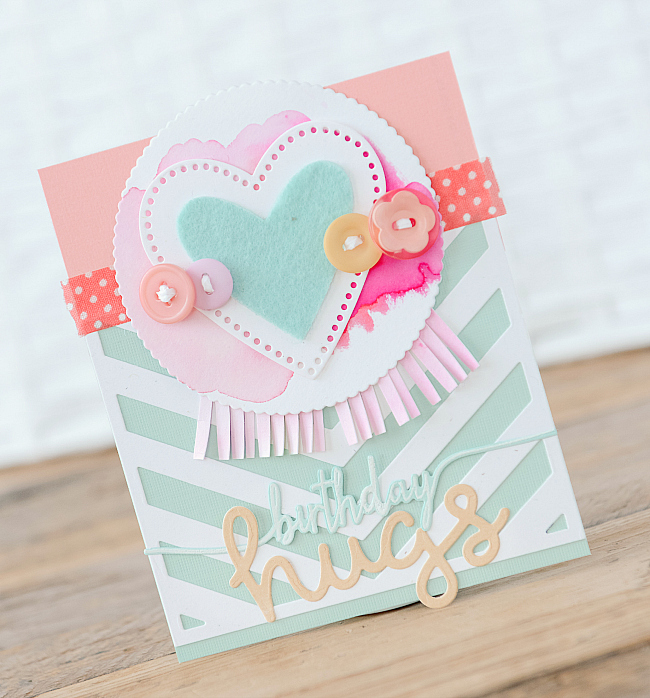 I used Raspberry Fizz, Lovely Lady, and Aqua Mist inks, as well as a few little buttons too! I think my stash is all ready for the upcoming birthdays! Your cards are soo enchanting!